Music-orientated social networking site Last.fm has struck a deal with SonyBMG . The pact means that users of the site will be able to listen to artists such as the Foo Fighters, Justin Timberlake and Dido directly from the site. Last.fm has 20 million users and was bought for £140 million by American broadcaster CBS in May. The site also announced a 'content partnership' with EMI in February enabling EMI artists to be accessed by the Last.fm userbase. "This partnership affords Last.fm users a whole new set of terrific content for building community," said Martin Stiksel, Last.fm's co-founder. "We've always aimed to have everything ever recorded available to listen to on our site. And having access to Sony's collection of some of the world's most popular music takes us another huge step closer." 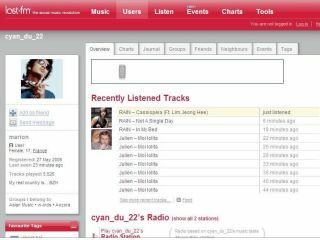 Last.fm traces what its users play on their PC or MP3 players to provide recommendations and connect them with other like-minded individuals.